A fresh, but tradition-inspired look and listen re Billie Holiday. Home » Music » A fresh, but tradition-inspired look and listen re Billie Holiday. 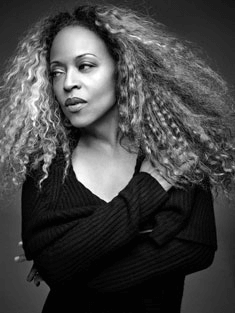 Cassandra Wilson, “America’s Best Singer” said Time Magazine when she was 46, keeps on exploring new realms of American music. She has a new project exploring the legacy and the soul of Billie Holiday. Consequently, don’t expect some kind of standard club-date-like appearance. Rather this is a foretaste of a CD emerging on that birthday. Sure, double-Grammy Award Wilson has often gone in her own way in jazz, vintage blues, country and folk music. She also had one of the leading roles in Wynton Marsalis’ Blood on the Fields, the first jazz work to receive a Pulitzer Prize. You can, though, expect her to play guitar as she has done since the age of 12, inspired by her father’s instrument of choice. Later inspirations, singing-wise, are Abbey Lincoln, Betty Carter and Miles Davis. She is joined, as she has been before, by violin/mandolin player Charlie Burham, a frequent collaborator too with James “Blood”Ulmer. New Orleans-tradition-trained Jon Cowherd is at the keyboards. Bassist Lonnie Plaxico is her music director; his credits are a page-filling Who’s Who list.With them come guitarist Kevin Breit and drummer John Davis.